Its origins are very old and according to some experts, this breed would be descended from imported dogs from Greek settlers in the region. It is described in various books and tales of the past two centuries. This dog was mainly used to keep wolves away from the flock at grass, either sheep or goat. 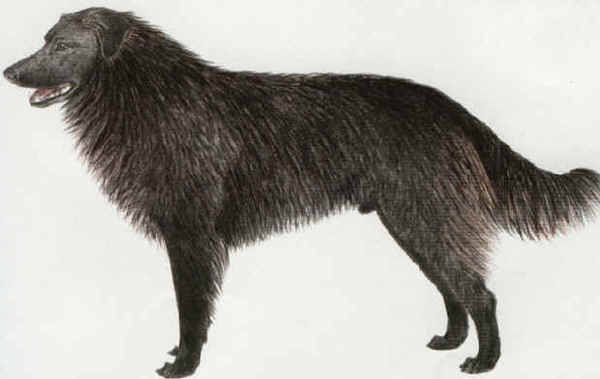 But since the wolf does not exist in those regions any longer, these ancient dogs have had no reason to be applied; therefore their local presence has disappeared rapidly. In 1972 this breed made its first appearance in the exposition at Cosenza, Italy, not competing though; seven quite homogeneous examples were presented on the occasion. Medium withers height, 63-65 cm tall, hie coat is long but not very wavy, black shading to red in the hot season. The breed, however, is well-built with a solid powerful body and muscles. The bone structure is in good balance with the trunk. Extraordinary brave fearless and daring, he is able to face his antagonist, the wolf, without any difficulty. Loyal to his master, he can look after and protect the livestock, being very reliable on work, careful and precise.